when Jesus gave her back her health, and not only her health, but restored her once again to her community, from which she had been ostracised because of her blood-ailment. One was given back to her family, the other to her community, and both were profoundly affected by their encounter with Jesus. They got their lives back again! 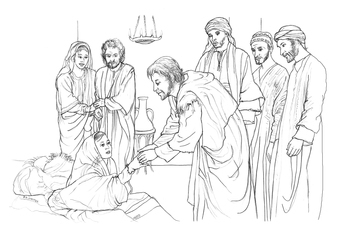 The two events related in today’s Gospel are told to give us hope, and to give us the example of the power of faith in Jesus,- the faith and desperate pleading of the President of the Synagogue, Jairus, the girl’s father, and the faith of the woman who, in spite of all the men present, crept up and touched the hem of Jesus’ garment. Faced with such faith, in both people, power went out from Jesus. Mark is always presenting Jesus as the Son of God, the Son of Man, with power: a teacher, one who calls disciples, one who has authority over the evil spirits, and one who cures lots of people, through the power of God that was in him. Jesus’ power still gives life, if we but ask or even ‘touch the hem of his garment’ with faith. In the face of all the opposition that disciples undoubtedly face daily today, Jesus Christ is Son of God, one of us, and teaches, calls, delivers, and heals with power. We just bring ourselves to him, with our needs, our illnesses of any kind, our dis-ease, and lay them before him in faith. Not a prayer of ours will go unanswered,- even if at times the answer is not what we would have preferred. Jesus heals. Jesus gives us back our lives. Jesus restores us. The Feast of Sts. Peter and Paul was celebrated on Friday, June 29th. They are both Patrons of Esker Church, and of the local parish church of Kiltullagh, Co. Galway. This goes back to the name of the Dominican Abbey Church in Athenry, founded in the 1200′s. The Dominicans later took refuge in the Esker area, during Penal Times, and built a monastery here in the 1700′s, and the present church c. 1840. The Redemptorists took over Esker c. 1903.